LAKE MANAGEMENT: We’ve been in the lake management business for over 35 years. In that time we have proven consistent monitoring is the key to a healthy lake. We offer a variety of service packages and are able to meet any lake or pond need. We visit some of our clients daily; others are on bi-weekly or weekly schedules. During each visit we remove unwanted plant life, algae, and debris. We monitor fish activity and water levels. 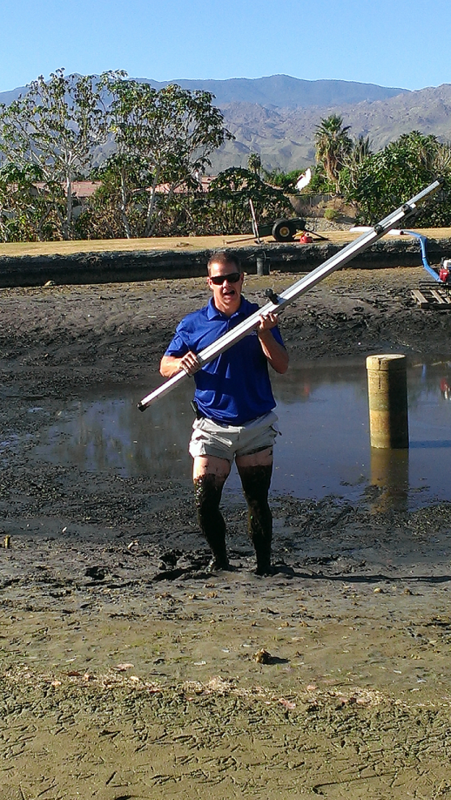 We clean skimmer baskets, brush rocks and hard surfaces, and ensure proper equipment operation. Our staff is not only cleaning your lake – they are educated to study and monitor your lake. We will detect minor changes in the aquatic environment long before they become “problems.” We introduce beneficial plants and fish and, if necessary, apply the proper chemicals in the proper amount at the proper time. We prevent any nuisance species from taking over your water feature. This is how we keep the ecosystem balanced and provide the CLEAR water our customers demand. CONSTRUCTION: Adding a lake to your property enhances value and provides tranquility like no other outdoor element. Maybe you have a need to store water for irrigation? We are your lake / pond construction company! We specialize in design and construction of lined lakes and ponds. Our experience maintaining lakes gives us the edge when it comes to construction. We only construct lakes with the proper depth, size, shape and materials. We save our clients’ time and money in future lake management by incorporating aeration, circulation, and filtration. A balanced lake should take care of itself and improper designs make achieving this balance much more difficult or impossible. REPAIR: Have a lake or pond in need of repair? Big or small we can fix it! UV exposure, tree roots and erosion can damage your lake liner. We have the ability to find the problem and repair it using the latest methods and materials. We will fix it right the first time. We will discourage you from adding a “Band-Aid” repair and we won’t sell you anything you don’t absolutely need. CONSULTING: Need help solving a problem or designing a lake management program? We can help you. We will travel to your site, study your lake and figure out the root of its problem. We then provide you with a written program to fix it. Maybe you have the staff to service your lake but don’t have the knowledge they need to be successful. We can work with them to get the job done right the first time. We can educate them in what to watch for so future problems are prevented. Getting the proper help and avoiding costly sales-pitches is money well spent. FISH STOCKING: Fish are an important component in any lake or pond. They control insects and prevent the spread of viruses like West Nile and Zika. They consume phytoplankton and zooplankton which; if left unchecked, can turn your water unsightly shades of green and brown. Grass carp consume aquatic plants which reduces the need for costly herbicide applications. Let’s not forget the joy sportfish species can add to your lake. We haul and stock all types of fish. We also handle all the permitting required to obtain certified, healthy fish for your pond. We only obtain fish from reputable hatcheries which ensures no unwanted invasive species are transported or introduced to your lake. We also have the equipment and ability to electro-fish. Electrofishing allows us analyze your fish population and remove any unwanted fish species. AQUATIC PLANT INTRODUCTIONS: Plants are essential to any lake or pond. Plants provide habitat for fish and utilize nutrients which would otherwise be available to unwanted algae species. We stock several types of beneficial submerged plant species which filter the water and help keep your lake as CLEAR as possible. The species we use are not only effective but also the easiest to maintain. We stock a variety of decorative plant species too. Water lilies, water iris, pickerel, and canna are a few of the species we use to add beauty to your lakes. These plants also protect your shoreline from erosion, attract waterfowl, and add brilliant color your landscape. PLANT HARVESTING: Have a weed or cattail problem? We are the proud owners of THREE underwater aquatic plant harvesters. If our crews can’t remove an over grown plant population in a timely and efficient manner – our machines sure can! We also specialize in the proper application of the correct herbicide, using the correct amount at the correct time of year. If eradication is your goal we will achieve that in the most cost efficient manner possible. CIRCULATION PUMPS, AERATION, FLOATING FOUNTAINS: Keeping your water moving is important to keeping your water clean. We distribute, service, and install circulation pumps and motors up the 50 horsepower. We design, install and repair all types of sub-surface diffused aeration systems. We sell, install, and service all types of floating fountains. Do not let your water sit stagnant – keep it moving efficiently and economically! SCUBA SERVICES: Have a clogged screen? Need to have an intake or equalization pipe plugged so your plumbing can be serviced? Maybe a submersible pump is in need of repair? We are PADI Certified scuba divers. We have the experience and equipment needed to safely and effectively take care of all your underwater needs.